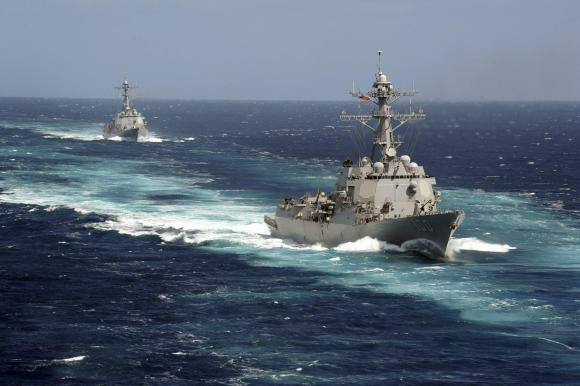 The Arleigh Burke-class guided-missile destroyers USS Kidd and USS Pinckney are seen en transit in the Pacific Ocean in this U.S. Navy picture taken May 18, 2011. Kidd and Pinkney have been searching for the missing Malaysian airliner and are being re-deployed to the Strait of Malacca of Malaysia’s west coast as new search areas are opened in the Indian Ocean, according to officials on March 13, 2014. (Reuters) – Military radar data suggests a Malaysia Airlines jetliner missing for nearly a week was deliberately flown hundreds of miles off course, heightening suspicions of foul play among investigators, sources told Reuters on Friday. Analysis of the Malaysia data suggests the plane, with 239 people on board, diverted from its intended northeast route from Kuala Lumpur to Beijing and flew west instead, using airline flight corridors normally employed for routes to the Middle East and Europe, said sources familiar with investigations into the Boeing 777’s disappearance. Two sources said an unidentified aircraft that investigators believe was Flight MH370 was following a route between navigational waypoints when it was last plotted on military radar off the country’s northwest coast. This indicates that it was either being flown by the pilots or someone with knowledge of those waypoints, the sources said. The last plot on the military radar’s tracking suggested the plane was flying toward India’s Andaman Islands, a chain of isles between the Andaman Sea and the Bay of Bengal, they said. Waypoints are geographic locations, worked out by calculating longitude and latitude, that help pilots navigate along established air corridors. A third source familiar with the investigation said inquiries were focusing increasingly on the theory that someone who knew how to fly a plane deliberately diverted the flight. “What we can say is we are looking at sabotage, with hijack still on the cards,” said that source, a senior Malaysian police official. All three sources declined to be identified because they were not authorized to speak to the media and due to the sensitivity of the investigation. Officials at Malaysia’s Ministry of Transport, the official point of contact for information on the investigation, did not return calls seeking comment. Malaysian police have previously said they were investigating whether any passengers or crew had personal or psychological problems that might shed light on the mystery, along with the possibility of a hijacking, sabotage or mechanical failure. As a result of the new evidence, the sources said, multinational search efforts were being stepped up in the Andaman Sea and also the Indian Ocean.